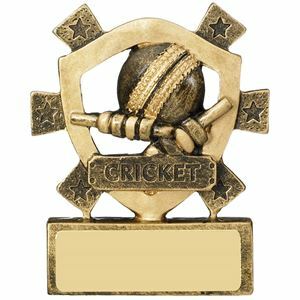 At Impact Trophies & Medals, we offer a huge range of cricket trophies, medals and awards suited to any cricket competition or league presentation. Our extensive range includes cricket ball trophies, figure top cricket awards and shields & plaques for cricketers. 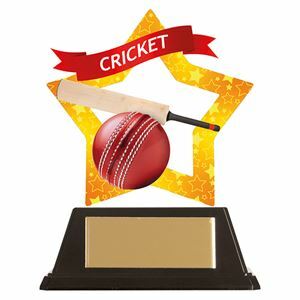 Impact Trophies & Medals are a leading retailer of cricket trophies & awards. 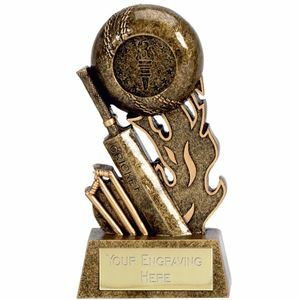 Great for personalisation, many of our figure top cricket trophies and wicket-keeper awards can be personalised with high quality text engraving and printed logo inserts, to perfectly meet all your cricket presentation needs. Youngsters will love this magnetic award. 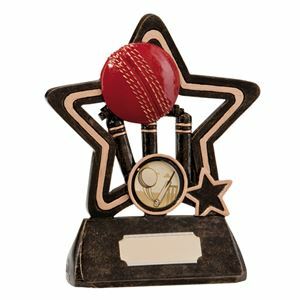 An affordable award with a difference, the Mini Magnetic Cricket Award displays an embossed cricket ball and bales with shooting stars in the background. 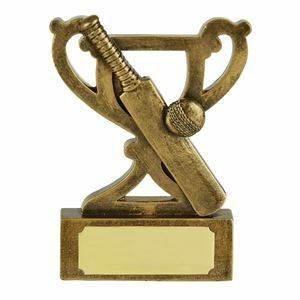 There is a banner with the word CRICKET and the option for the award to be personalise with a FREE engraving text plate. This award is cast from high grade resin, glazed in two toned gold and is magnetic - attachable to magnetic surfaces only. Affordable enough to award the whole team. Displaying an embossed image of a cricket ball and bales which are set in a shield shaped frame and decorated with stars. The trophies has a banner inscribed with the word CRICKET. Cast from quality durable resin, this mini shield is glazed in a two tone gold and bronze lacquer for an attractive finish. This small award can be personalised with a FREE engraving for that personal touch. Set the field on fire with the Scorcher Cricket Trophy. 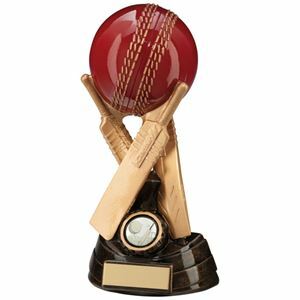 Made from gold varnished resin, the scorcher trophy displays a large golden cricket ball, with seam detail, above a flame shaped design. the trophy also features a bat and set of stumps. 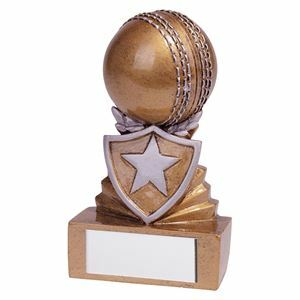 The Mini Star Cricket Trophy features a gold and bronze coloured cricket ball standing inside a golden star. Displaying a cricket banner at the base of the star, the resin trophy is coated for a high shine finish. Excellent price. Cast from high grade resin and varnished in a glossy antique gold, the Cricket Mini Cup Award features a cricket bat and cricket ball set on a small die-cut cup. 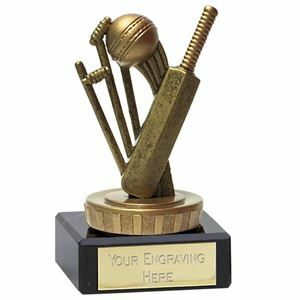 This affordable trophy is supplied with a FREE engraving plate that can be personalised with a text message and is supplied in black picture box. This glossy star shaped award would make an attractive yet practical award. Made from a premium grade of clear acrylic, the plaque has been printed with a striking image of a large red cricket ball and a cricket bat, produced in high definition full colour. Surrounded by a gold frame the trophy also features a red banner printed with the word CRICKET in white text. 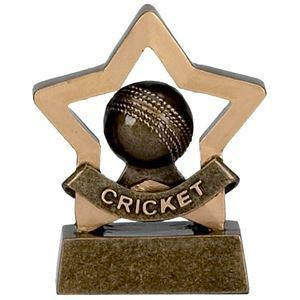 The Mini-Star Cricket Acrylic Plaque comes with a small black plinth which is easily fitted to the plaque to create this great value award. 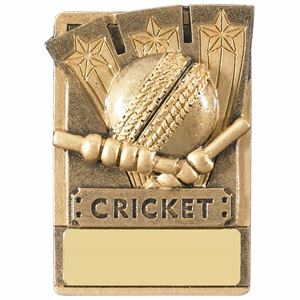 The Sentinel Cricket trophy is an antique gold resin trophy coated in a high shine glaze. The trophy displays a cricket bat set in front of some stumps, with a cricket ball knocking the bail off. Standing tall, this sentinel trophy is surrounded by shooting stars. 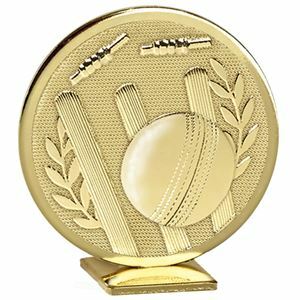 The Shield Mini Cricket Award is made from bronze resin and set upon a rectangular shaped base. A gold cricket ball is supported on a small riser, decorated with a shield bearing a silver star. The ball is finished with realistic white stitched detailing and the trophy has been coated in a performance varnish for maximum shine.